Arrogate made easy work of a full field of 12 runners, including 2016 Horse of the Year and fan favorite California Chrome. Saturday, January 28, 2017 at Gulfstream Park in FL featured the inaugural running of the 2017 Pegasus World Cup, featuring an incredible $12 million purse. This race replay includes the post-race conference with winning jockey Mike Smith. In what was the final breeze of his storied career on the racetrack, California Chrome worked Saturday morning at Gulfstream Park in preparation for his swan song, the $12 million Pegasus World Cup Invitational (G1) Jan. 28. California Chrome, with regular exercise rider Dihigi Gladney in the saddle, stepped onto the track at precisely 7:32, on a balmy morning in South Florida. After being backed-up the wrong way for a quarter-mile, Gladney turned the 6-year-old around and began to gallop past the clubhouse, where fans and horsemen looked on in eager anticipation of the final breeze from North America’s richest racehorse. As is California Chrome’s custom, he worked faster than what it appeared. A nearly motionless Gladney guided him through the five-furlong move, which was timed in 58.81, following fractions of 23.66 and 35.12. The 6-year-old galloped out six furlongs in 1:12.41. On hand for the work was Art Sherman, California Chrome’s 79-year-old trainer, who arrived in Florida late Thursday evening from California. 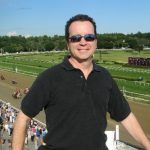 “I’m feeling great, I said if he went in a 1:00, I would be happy, and galloped out in 1:13,” Sherman said to the media outside Barn 2 following the work. “He went in 58 4/5 and galloped out in 1:12 1/5. He’s ready. That was an awesome work. I thought it was sensational. 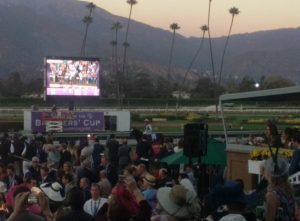 The Pegasus, the world’s richest race, will afford California Chrome the opportunity to have a rematch with Arrogate, who beat him by a half-length in their only meeting, the Breeders’ Cup Classic (G1) Nov. 5 at Santa Anita. “I’ve been wanting a rematch for a long time now,” Sherman now. Sherman, a former jockey, rode at Gulfstream Park, and saddled one runner here as a trainer in 2004. He was surrounded by a lot of well-wishers as he stood in the grandstand to watch Saturday’s work. One of the perks of training California Chrome for Sherman is seeing the amount of joy the horse has given to his large and loyal fan base, especially those who flock to his home base at Los Alamitos to catch a glimpse of the superstar. “He has such a following,” Sherman said with a big grin. “I have 20 women coming out from Orange County [for the Pegasus]. They are all ‘Chromies,’ I call them. They have never missed a workout and I work him like at 5:45 in the morning. 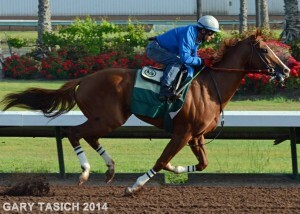 Superstar California Chrome helps lead the Southern California racetrack to a 16% increase in handle. 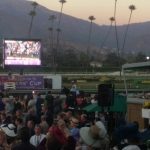 Los Alamitos Race Course executive Brad McKinzie was significantly upbeat after the last race of Cypress, Calif., racetrack’s two-week meet. The potential rematch between Arrogate and California Chrome in the Pegasus World Cup has moved a significant step closer after Juddmonte entered into a private deal to purchase an place in the $12 million showpiece from Coolmore. January 28, 2017 is the big race at Gulfstream Park in Hallandale, Florida. Kentucky Derby champion California Chrome smashes to victory in the 2016 Pacific Classic, defeating a solid Grade 1 field that included the super mare Beholder and the talented runner Dortmund. Later this year California Chrome will attempt to become the first 5-year-old Thoroughbred to add the Breeders’ Cup Classic to a resume that includes the Kentucky Derby. Derby winners who won the Classic are: 3yos Unbridled, American Pharoah and Sunday Silence, and 4yos Ferdinand and Alysheba. It’s a difficult task and rare for an older horse to accomplish, especially since few Derby winners get to compete at an advanced age.